Tom and I love Indian food. Ok, maybe that is not accurate, because I been also saying that I love Italian food, and Mexican food, and Latin food ok, I think I also said here that I like Thai as well – Ok, I come clean, I love ALL FOODS. But Indian food is one of my top five. Like anything that is new to me, I experience it first at a restaurant and then of course I come home and hit the Internet to find it and make it a home. So when our host of the month, Cynthia and Sam choose the menu for this week in our Gutsy Club, I was really excited, since this is one of the dishes we tend to order in our local Indian restaurant. 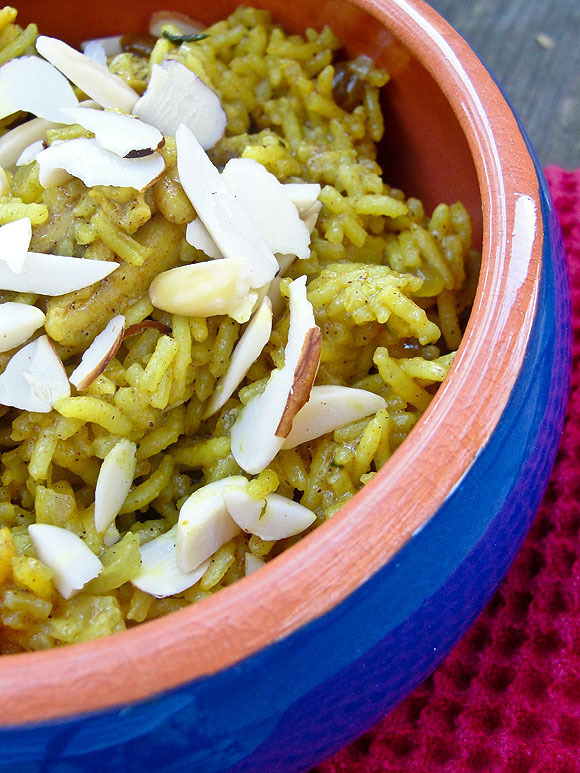 As I wrote on our Gutsy Cook pre-post, Chicken Biryani, happens to be the most popular Indian recipe around the globe. In India, every region has it’s own version. Some biryani recipes can take hours to prepare. 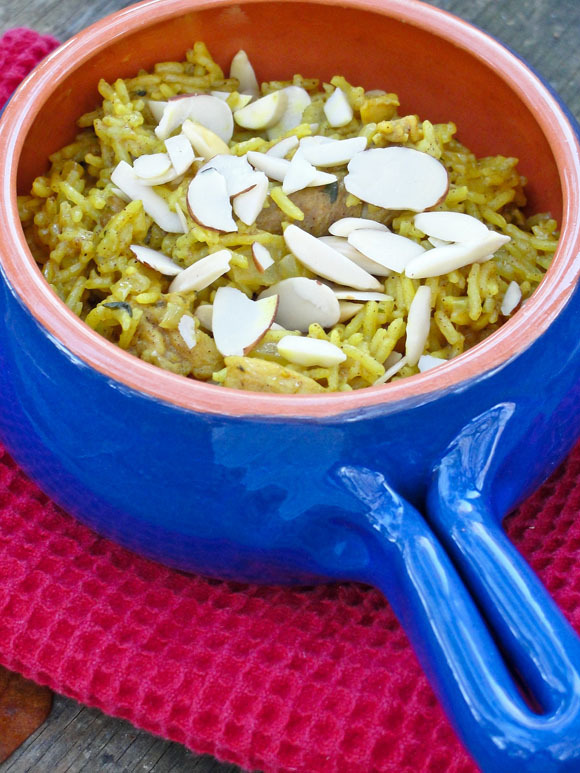 The books recipe is quick and easy since the chicken and rice get cooked together. In less than 30 minutes I had food in our table making this a perfect dish for any day of the week. I did not deviate much from the original recipe. But, if you know me, I did put my “spins” on it. I cooked the onions to a deep brown color and also used cinnamon powder instead of a stick, mainly because I ended up using the last one on the poaching liquid of my pears for the tart early in the day. I did not notice a difference at all. The dish was full of flavor, the perfect color of yellow, due to the curry, which I have to come clean, went a bit heavy, but then I do love my curries. I also used chicken thighs instead of the breast; we are thigh kind of people in our house. And since I did not have curry leaves, I used chopped cilantro instead, other than that, pretty much everything was the same. Heat the oil and butter in a large flameproof casserole over medium heat. Add the onion and cook until brown, then add garlic and cook, stirring often, about 4 minutes, until translucent. Add the cinnamon, cardamom pods, and curry leaves, (in my case I added chopped cilantro) if using, and cook, stirring often, for 5 minutes, until fragrant. Add the curry powder, turmeric, and cumin, and stir for 1 minute. Add the chicken. I wanted to caramelized the chicken a bit, so I did turn my stove heat to medium-high until the chicken had a nice crusty look. Note: your pan my have some of the brown bits sticking to the bottom – which is fine think – FLAVOR OVERLOAD. Add the rice and raisins and stir well. Pour in enough stock, to just cover the rice. Bring to a boil, scraping up the browned bits. Reduce the heat to medium-low and cover. Simmer about 15 minutes or until the rice is tender and has absorbed the stock, adding more stock if the mixture becomes dry. Transfer to a serving dish, fluffing the rice with a fork. Sprinkle with almonds and serve hot. I also made the Pear, Mascarpone and Hazelnut Tart – that’s coming up in Part 2 of the post tomorrow. In the meantime don’t forget to visit the other Gutsy cooks to read and see their take on this weeks menu.